What you are going to do for the weekend? I have your answer friend! Grab a pen and write down this grocery list. See Below. Travel the distance to your local health food store/shopping mart/ or Amazon prime delivery. Collect items mentioned below and be prepared to be amazed at your own creation. These bars are incredible in every sense of the word. In a meta-anaylsis including 10 people and 3 unofficial studies, 100% of the participating tasters thought these bars maintained energy and stamina 90% better than 100% of the other products on the market. Also they have the words chocolate / nut /and butter in the title….still hesitating? Health food is too expensive. Deep Sigh. What can I have for a treat? It’s true… I am a stern task master. My honest answer for this is... NOTHING. It is possible for humans to survive as long as 40 days with only water. Yes, humans have fasted for 40 days with nothing and lived to tell the tale. David Blame the famous magician completed a 44 day fast, drinking only water. Another Guinness Book of World Records has a man logging in at a 49 day water fast. What?! And drum roll…..Check out this case study where a 400 plus pound man fasted for 382 days given no caloric food, simply some multivitamins…what the deuce?!! Not recommended! Please do not try this at home! I mention it only to give you a new set of goggles to see the world, an educated mind is an open one. The inability to make it from lunch to dinner without crack addict tweaking is probably due to a lack of insulin sensitivity. Think of insulin as the chelsea muscle bound bouncer who is ushering sugar into your cell wall. When you eat sugar all the time, there is a ton of sugar in the streets (your blood vessels) waiting to get into the club (your cells) to be used for energy. Sugar wants in, it wants to party, it wants to rage in the cell….This is where the party should be happening. Sometimes there is more sugar than the bouncers can handle. The sugar is left in the streets and it starts to riot in your body. This is bad. This is LA after the Rodney King verdict. This is a Gaggle of Tweens being denied Backstage access to a One Direction concert. This is the road to type 2 diabetes. One way we can increase our sensitivity to insulin is eat less processed sugar. Another is take breaks in between feasting. The exception being high performers, professional athletes and jobs which are highly physical. Back to the bars..get on with it Freddie! I offer you a better snack alternative. These bars are sugar free and Diabetic friendly. These bars are packed with nutrient dense ingredients. These bars contain collagen protein, a valuable resource for rebuilding joints, ligaments and tendons. I’ve added organic cut oats, packed with fiber. They have coconut oil supplying healthy fats for the brain, skin and energy. Ground pumpkin seeds which are amazing for colon health and a natural anti parasitic agent. I am always looking out for your colon. I have covered the the top with organic chocolate, giving them crack status. Add 1/2 cup of boiling water to one package of Natures Path organic oats. Or measure 50-60 grams of oats of your choice. Set aside and allow to saturate. Blend 3/4 cup ( one handful ) of Pumpkin seeds in the Vitamix or High end blender of your choice. Grind to a fine powder. Set Aside. To a small sauce pan on the lowest heat add 1 and 1/2 tablespoons of raw organic cacao powder, 1 and 1/2 heaping table spoons of organic coconut oil, 2 dashes of Stevia. Stir chocolate with a wooden spoon till an even consistency is achieved. Set aside and turn off heat. In a mixing bowl combine the Oats, the powdered ground pumpkin seeds, 2 heaping table spoons of Grass fed collagen powder, 1/2 tea spoon of ground vanilla, 3 dashes of stevia, 2 heaping table spoons of almond butter and 1 1/2 teaspoon of cinnamon. Stir till it’s a giant nutty ball of stickiness…she is messy…I’m warning you. 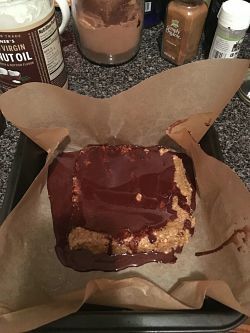 Line a small baking pan with parchment paper and pack the dough into a square, you can make this as thin or thick as you would like. Here is what Mine looked like accented by my gigantic Man-Hands. Place these to harden in the freezer for 20 minutes, remove from parchment paper and transfer to a plate for another 15 of additional hardening. You are done! Slice your bars to desired size and try one on for size. These puppies are an amazing energy boost. Have them in your freezer or fridge, ready to go for a craving and snack alternative. It’s like your eating a candy bar. Warning: Due to the coconut oil which freezes below room temperature these need to be kept cool. The fridge works once they are frozen, but the the freezer keeps them extra crunchy, it’s your choice. They will also travel well in a lunch cool pack. Enjoy and happy creations in the kitchen. Would it be ok to substitute brown sugar for stevia? Tony, of course you can substitute anything you’d like. I’d use coconut palm sugar if you are going to use anything that is considered refined!